Sep 19, 2018 | By: John K.
If you’ve migrated your website to PhotoBiz 8 and you’re using Google Search Console (formerly Google Webmaster Tools) to track your website performance, you may have recently gotten an email like the one below, telling you that “Mobile-first indexing” has been enabled for your website. In March 2018, Google announced it would begin migrating sites that follow the best practices for mobile-first indexing. You don’t need to be alarmed by this email! Your website is doing great with how it’s being indexed by Google. 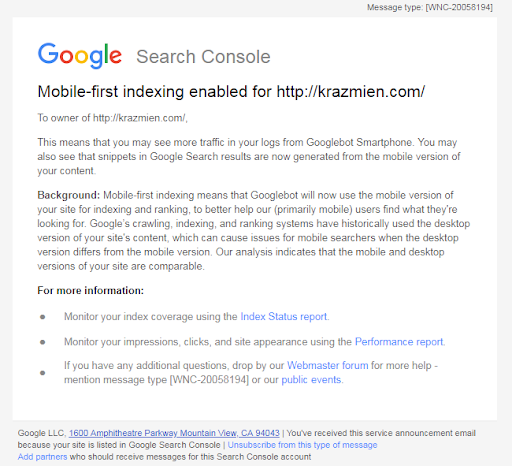 This email is simply telling you that the mobile content is being indexed first by Google. Your PhotoBiz 8 website is mobile responsive. You have peace of mind knowing that your website provides the same exact experience and content for desktop visitors as it does for mobile visitors. On top of your website content being the same, our powerful SEO tools ensure that your website has the same metadata (meta title, meta description, and meta keywords) as well as sitemap submitted to Google as well. These practices are preferred by Google. If you haven’t already made the switch to PhotoBiz 8, you can do it at any time from your control panel. If you just don’t have the time to work on your website, we can do it for you! Our Website Jumpstart is just $250, and we can move you over simply. As always, if you have questions about making the switch to PhotoBiz 8, search engines, or any of the other features on your PhotoBiz account, give our Passionate Support team a call and our Web Consultants will help you out however we can. Show Google you mean Business!